BR Williams was awarded the ISO 9001:2015 Certification, recognizing quality standards that define effective quality management worldwide. OXFORD, ALABAMA, UNITED STATES, October 24, 2018 /EINPresswire.com/ -- Recently, the BR Williams Logistics Services Division, headquartered in Oxford, Alabama, was awarded ISO 9001:2015. Certification by the global organization, NSF-ISR, the gold standard of the quality certification industry, is reserved for only the top companies in any industry. ISO 9001 Certification bases its decisions on stringent quality standards that define effective quality management worldwide. By receiving this globally recognized certification, BR Williams Logistics Services is identified as a top logistics company and supply chain management enterprise, excelling in service, capability, and technology. BR Logistics Company is a premier 3rd Party Logistics (3PL) Management Company. As an independent division of BR Williams Trucking, Inc., BR Williams Logistics Management plays a crucial role in supporting supply chain initiatives for world-class companies engaged in automobile manufacturing, defense, home improvement, chemicals, textiles, food production, metals, industrial packaging, and more. Although BR Williams Logistics Management has assets of BR Williams Trucking, Inc. at their disposal, this 3PL utilizes a network of like-minded, professional trucking companies to provide the highest levels of service. BR Williams handles national and international shipments using the state-of-the-art equipment and the best logistics providers for direct and intermodal freight management. BR Williams Logistics has instituted load and inventory tracking with accessible portals to monitor each shipment to ensure timely and damage-free deliveries. Each truck is equipped with GIS capability, and every driver’s safety record is carefully reviewed. Effective supply chains need well-managed warehouses for inventory storage and product staging. BR Williams Logistics Services utilizes several first-rate facilities throughout the nation to help clients best manage their inventories, accommodate production surges, and provide emergency stock in case of sudden demand increases. With the BR Williams’ WMS (Warehouse Management System), clients can monitor their inventories in real time to optimize raw inventory purchases, plan production, and reduce lead-times. 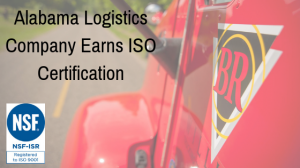 For BR Williams Logistics Services, the ISO 9001:2015 designation is an added endorsement of their longstanding philosophy of Honesty, Integrity, and Service, unwavering company values for over sixty years. To discuss your Distribution, Logistics, or Transportation Services options, please contact Matt Nelson.